Still in customary order before Moto3 gets shunted to the back of the running order on race day, it was down to the lightweight class to get Saturday underway. The records kept tumbling as Jorge Navarro settled quickly to the Silverstone corners, not letting yet another new track stand in the way of success the Estrella Galicia 0,0 rookie started his last lap just before the flag and finished with an unbeatable 2m 12.440. That time set a new record, and also under the old best time was Karel Hanika who came along for the ride on his Red Bull KTM Ajo millimetres behind Navarro as the pair looked in danger of racing instead of qualifying. He was in a Honda sandwich as Danny Kent, who’s time from just minutes earlier was the record to beat was pushed down to third for Leopard Racing. Championship leader Kent revealed his main motivation for spending so long in his box was to avoid another Brno-style tyre mishap, while the home rider was also happy to be well ahead of nearest title rival Enea Bastianini on the grid. Fourth went to his Leopard team-mate Efren Vazquez, with Isaac Vinales, who keeps his job At RBA at the expense of Niklas Ajo, rewarding the team with fifth on the grid. Row two is completed by Alexis Masbou in sixth for SaxoPrint-RTG. Gresini’s Bastianini starts from seventh with Sky Racing VR46’s Romano Fenati managing a top ten placing in qualifying in eighth, with row three completed by another race winner – Miguel Oliveira – in ninth one place ahead of his team-mate Brad Binder on the third and final Red Bull entry in tenth. Brno winner Niccolo Antonelli qualified down in 18th. John McPhee (SaxoPrint-RTG) starts 12th with two more wild-card Britons on the grid. Taz Taylor starts 35th, he is joined by Luke Hedger in 36th. Tito Rabat was the long time leader in Moto2 until a frantic final few minutes saw Sam Lowes, Alex Rins and Johann Zarco all swing into contention for pole. Sam Lowes made life difficult for himself after missing his board telling him to come back in for fuel, resulting in a sprint back from the far side of the track, pushing his bike. With just six minutes remaining at the long track there was only time for the Speed Up man to have two laps on his return, but he made the final one count when it mattered most, stealing a late pole, his second after Mugello. Just 0.058 behind was Alex Rins, who had looked unbeatable on his Kalex after a stunning, dominant FP3. Though not in charge all the way through the Paginas Amarillas HP 40 rider looked to have found speed at just the right time before being bettered by Lowes as the chequered flag waved. The second place was all the more impressive given that the Spaniard had just had his second arm pump operation of the season after Brno and was riding stapled up. 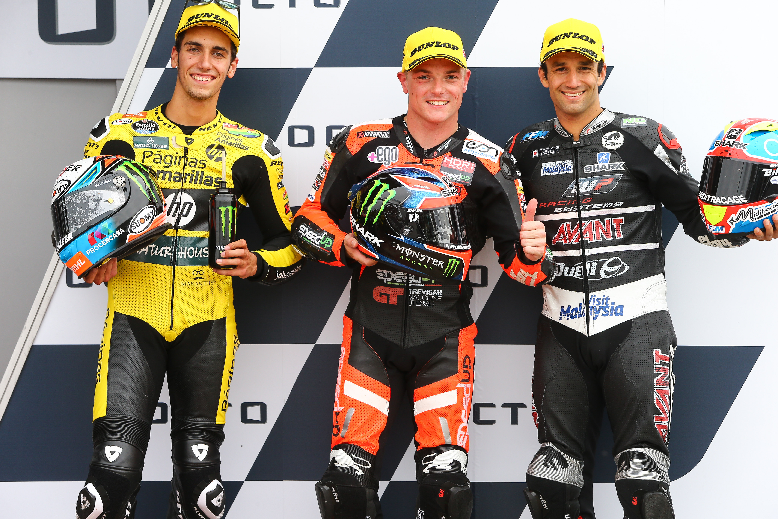 Third, in the final front row spot, is Johann Zarco. The championship leader was also under the lap record set that morning by Rins, the Ajo Motorsport rider’s late PB was not enough to see him drop a place as the times dropped. First man under the old record; Tito Rabat; saw the session slipping away, the Marc VDS and reigning champions final effort was to end in disaster, falling from his Kalex and clipping and taking Dominique Aegerter down with him. Initial tests at the medical centre cleared Rabat to race with a diagnosis of severe bruising after the accident had originally looked much worse, the Spaniard being stretchered away from the track. Joining him on row two are Tom Luthi (Derendinger Racing Interwetten) in fifth, and a resurgent Taka Nakagami in sixth (Idemitsu Honda Team Asia). Row three will line up on the grid with the late improving Jonas Folger (AGR Team) in seventh, Lorenzo Baldassarri (Forward Racing) in eighth and Alex Marquez (EG 0,0 Marc VDS) ninth after a fall. Though also a crasher Sandro Cortese fills the final spot in the top ten for Dynavolt Intact GP. Bradley Ray has a wild-card ride this weekend and starts 31st.